In spite of wonderful New Years resolutions to lessen the UFO pile in 2013 I have too many starts in the 21 days since Jan 1. The first block is called Jumping Jack Flash ..... How could I resist a block bearing that wonderful name ? Just Us Quilters on FB is featuring a spool block for their stitch a block a day. I resisted buying a cute tea cup panel when I spotted it before Xmas but as soon as the spool pattern appeared I knew it owned me. Fussy cut tea cups will become the block centers. A memory quilt for a very special person. 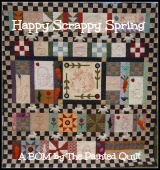 And who could resist the Mystery Quilt from the Quilts By Darlene blog ? And then I got hooked on Dresdens. Make sure to check out my blog on Friday to see the direction my sewing energy took this week. There is even one which might be considered a UFO if 15+ years of sitting on a shelf counts. My dream is that these not be on my UFO list next year. It's amazing how the grey in the jumping jack flash disappears into the floor pattern. I didn't even notice it at first. Looking forward to the Dresden blocks. We're NOT supposed to have dozens of UFO's? Darn! I'm ALWAYS behind in my stitching. Oh well. Cute stuff you are working on. Net resting spool block Frances and look forward to your dresdans.